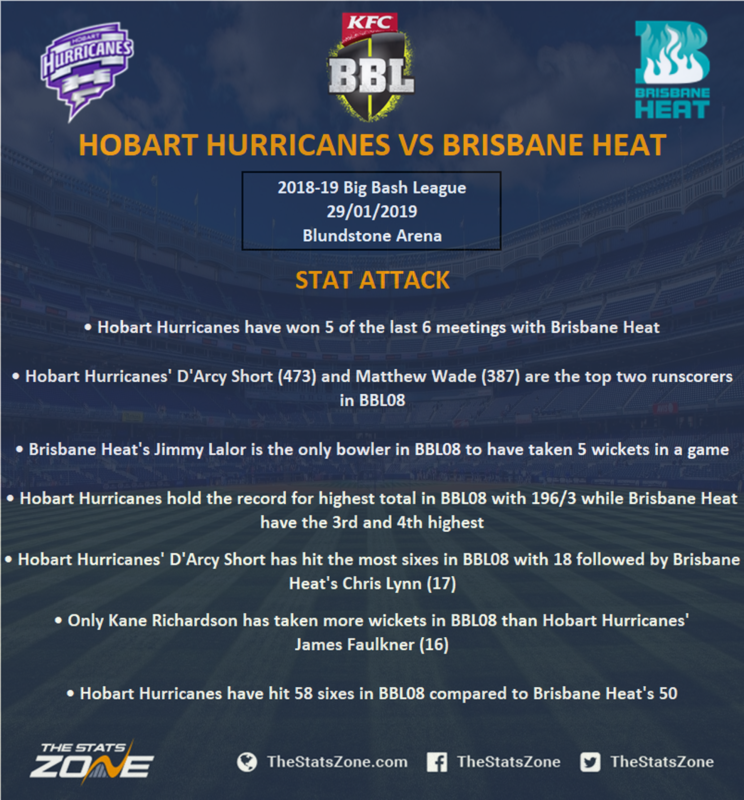 Hobart will be looking to bounce back from a heavy defeat to Sydney Sixers in their last match with the Hurricanes going down by nine wickets so they will be keen to bounce back and regain some momentum. The Hurricanes could have secured a place in the play-offs with a win against the Sixers but will be hoping to do that against Brisbane and all but seal top spot in the process. Former South African international Johan Botha announced his shock retirement from all forms of the game after the Sixers game with his absence opening up a place in the team although in reality he has not been such a key part of their bowling unit anyway. Brisbane Heat fell narrowly short in their run chase against Melbourne Stars in a defeat that leaves the Heat needing a minor miracle to make the top four and they will rue that loss after being in an excellent position to win it. The five-run loss leaves the Heat on just seven points with four matches remaining so that makes this match a must-win game for them but they will have to show more composure than they did against the Stars. Despite an improved performance from their previous game against Sydney Sixers, the loss was costly last time out although they do name the same squad of players for this match with Mark Steketee and Sam Heazlett unavailable as they play for the Queensland Academy of Sport 2nd XI team. Hobart Hurricanes’ bid to secure first place was temporarily halted by Sydney Sixers in their previous clash but a win against Brisbane Heat will ensure they finish top. The Heat come into the contest on the back of an agonising loss against Melbourne Stars that leaves them with an almost impossible task of making the final four. With the Hurricanes looking to bounce back, the favourites should win this one comfortably.